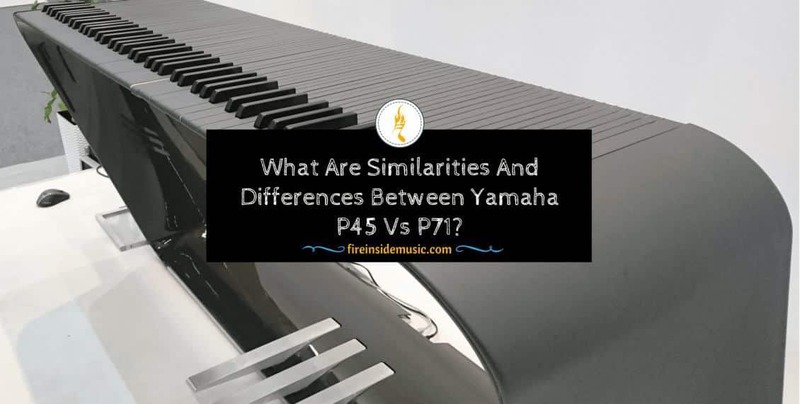 What are Similarities & Differences Between Yamaha P45 vs P71? Nowadays, there are various choices related to different kinds of digital pianos for you to pick up. To help you have the best digital piano, in my today article, I will provide necessary information about Yamaha P45 vs P71: The similarities and differences between them. These products are advertised on Amazon. You should spend time on understanding their strengths and weaknesses before giving your own decision. The information in my material is concerned with Yamaha P71 review and Yamaha P45 reviews. I hope that my helpful article can help you have the best choice. Before showing you certain differences between Yamaha P45 and Yamaha P71, I want to give you general knowledge about digital piano and some essential information related to it. What are pros of digital pianos? What should we look for a good digital piano? What are differences between Yamaha P45 and P71? What are similarities between Yamaha P45 vs Yamaha P71? Admittedly, digital pianos just appeared in the music world in the 20th century. However, musicians and pianists appreciate its strengths. Unlike other musical instruments, digital pianos can play lots of different tones of voice. Thus, you can play any song you want. This is also a good kind of piano for children to study musical instruments. The second advantage of a digital piano is that they are quite portable and lightweight. Hence, you can bring it along anytime and anywhere you like. It is obvious that the traditional piano does not have this feature. The third good point of digital pianos is its cost. I think you should put this point into consideration before deciding to pick up traditional piano or a digital one. Apparently, the price of a digital piano is not high as traditional piano. I am sure that low and middle incomes can afford to buy it. for a Good Digital Piano? Next, I will tell you some necessary criteria to evaluate a good digital piano. You should bear these following points in mind when looking for a good digital piano on Amazon. The first thing you need to check whether the digital piano is good or not is a keyboard. The standard keyboard has 88 keys. This ensures for producing high quality of sound as well as the ability to play various songs with distinct tones of voice. On the contrary, when you choose a digital piano which has fewer keys, this limitation certainly cannot create as many as tones of voice and lyrics as a digital one that has a full set of a standard keyboard. Another aspect of determining a good digital piano is weight resistance. You have to make sure that your digital piano can endure a certain weight. If not, your digital piano can be easily damaged. A good digital piano can put up with more than 10 kilos while the normal one only can endure about 6 kilos. Polyphony is the ability to create various tones at the same time. Obviously, traditional pianos do not have this feature. This point is an outstanding characteristic of the modern digital piano. If polyphony is ensured, I claim that you do not need to worry about how to deal with voice problems or other lyric issues. Higher polyphony indicator that a digital piano has, more tones of voice it can play. Another feature to evaluate a good digital piano is its display. A good digital piano will certainly have a conspicuous display system. This can ensure for you to see the level of volume, power, and other elements obviously. Thus, you can regulate your lyrics and music performance in a suitable way. A clear display system will certainly draw the attention of musicians, audiences, and pianists. Whenever you look at a digital piano, its display can ensure higher interaction between pianist and this musical instrument. Another thing to evaluate a good digital piano is its lifespan. 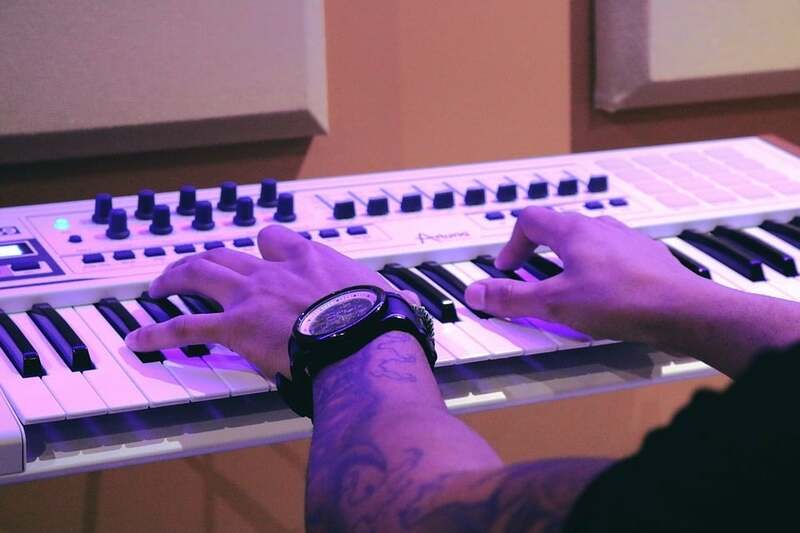 In fact, a digital piano works longer than the traditional one. Normally, the traditional piano can only be used in about 10 years. In the meantime, the corresponding figure for digital piano can double (roughly 20 years). This is a strong point that makes digital pianos more attractive than traditional ones. Cost and reputation are two relevant factors that you should take into consideration when looking for a good digital piano. 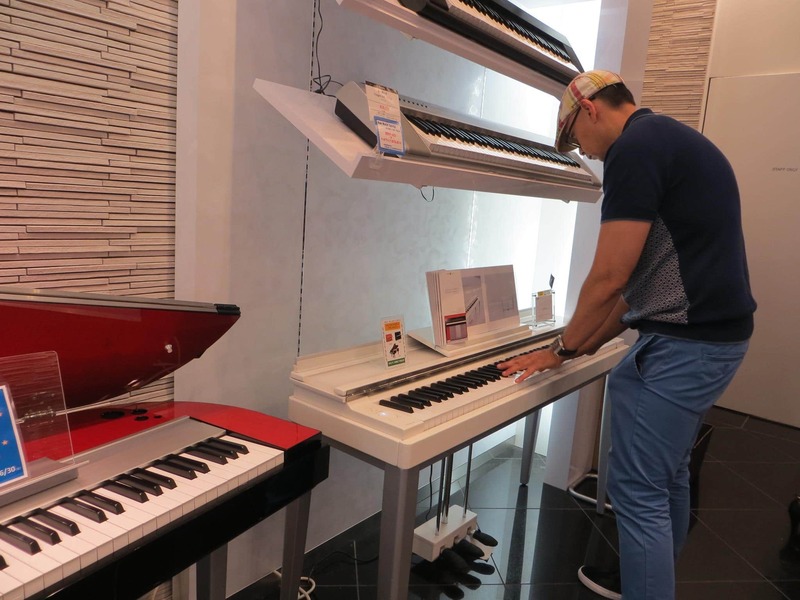 Surely, most buyers still want to purchase a good digital piano at the affordable price. Besides, the reputation of a digital piano brand also ensures a long-lasting insurance system. Last but not least, insurance also is an important criterion for a good digital piano. When a reputed manufacturer produces a digital piano, it will have a long insurance system. Normally, a good digital piano has the insurance lasting for 4 or 5 years. I am sure that no one wants their digital pianos to be out of work or encounter any problem. When you fall into these situations, good insurance of the digital piano brand can help you overcome easily. Long-Lasting insurance will create fame and build trust in buyers. It is undeniable that Yamaha P45 vs Yamaha P71 has become more and more popular on Amazon market in recent years. Young people are impressed by many good points of this piano. Both pianists and audiences appreciate its sound quality as well as portability. Yamaha P45 is a new brand of digital piano. Regarding its appearance, Yamaha P45 seems to look like P71 because of size, keyboard set, and color. Some people, thus, may not see certain differences between them at first glance. You can get insight into this point in Yamaha P45 reviews and Yamaha P71 review. Now, I will show you some certain distinction between them. You should read these features carefully to have an objective view. 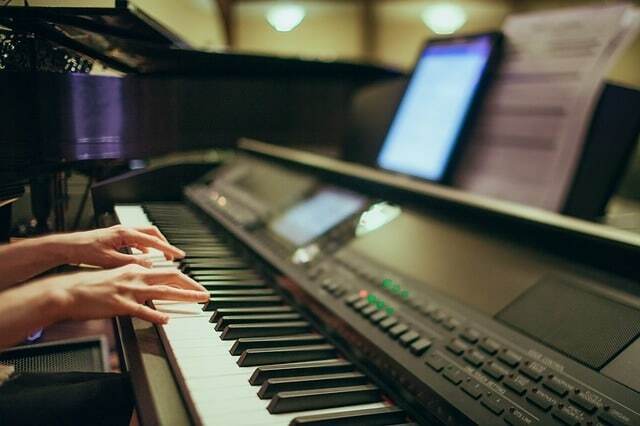 One of the necessary criteria to evaluate a good digital piano is the ability to connect to other devices. Therefore, you should consider this point carefully before deciding to choose which digital piano. Furthermore, the ability to connect to other devices also is a difference between Yamaha P45 and P71. I will show you this distinction. Even though they are made from the same manufacturer in Japan, many people still appreciate Yamaha P45 for its high ability to connect and match with other devices. You do need to worry about how to create interaction between P45 and your iPods, mobile phones, or USBs as this digital piano has available connection gates. Yamaha P45, therefore, seems to be favored than Yamaha P71. Meanwhile, this strong point does not appear in Yamaha P71 because it only has certain connection channels to few devices. Admittedly, this is a disadvantage of Yamaha P71. Therefore, you should consider it carefully before deciding to purchase this product. You can understand more about this difference when reading Yamaha P45 reviews and Yamaha P71 review. As I said above, polyphony is the ability to produce different tones of voices at the same time. This is the most important factor to evaluate a good digital piano. Polyphony may be a feature that can help you to differentiate between Yamaha P45 vs Yamaha P71. A strong point of Yamaha P45 is that it possesses a superior figure for polyphony. I am sure that this feature will certainly satisfy some strict pianists. High polyphony means that Yamaha P45 can produce more tones of voice than other digital pianos. The most striking feature of Yamaha P45 is that this digital piano can combine two distinct voices in such a mild and natural combination. On the contrary, Yamaha P71 has low polyphony when compared to Yamaha P45. This digital piano, hence, cannot make as many tones of voice as Yamaha P71 can do. Moreover, Yamaha P71 even does not have the ability to combine two different voices. Another difference between P45 and P71 is their cost. It is obvious that Yamaha P71 is less expensive than Yamaha P45. I think this point needs to be taken into consideration. To some extent, Yamaha P71 is more affordable to low and middle incomes. Therefore, to many pianists, Yamaha P71 is more affordable and favored. In reality, the number of Yamaha P71, which is sold on the digital piano market, is apparently superior to that of Yamaha P45. Another difference between them is their lifespan. In general, Yamaha P71 can work longer than Yamaha P45. Some recent researches related to the lifespan of different brands of digital pianos reveal that Yamaha P71 can be used in 20 years. Meanwhile, the actual figure for the lifespan of Yamaha P45 is a little bit shorter (more or less 16 years). However, I think that 16 or 20 years are still impressing number for the lifespan of a digital piano at present. Yamaha P71, thus, can be a good choice for pianists. Yamaha P45 vs Yamaha P71? Despite these above differences, there are also some similarities between Yamaha P45 and Yamaha P71. They have similar keyboard system, portability, sound quality, design, and insurance. The first similarity between two above-mentioned digital pianos is their keyboard. Apparently, both of them have a full set of the keyboard. They possess enough 88 standard keys for a good digital piano. In my point of view, this trait can fulfill the demand of children for learning how to play digital pianos. I strongly believe that most of pianists and audiences will fall in love with keyboard system of both P45 and P71. The second similarity between them is that these digital pianos have portability. They are lightweight as well as portable. Therefore, you can bring them along every time and everywhere you want. Many people usually bring Yamaha P45 and P71 along with their trips or during camping times. I also do hope that this plus point can become a helpful musical instrument during your performances. Sound quality is another similarity between them. In reality, both digital pianos can produce natural sounds. Furthermore, they even create melodic songs that are beyond your expectation. In some cases, pianists claim that when you play these two pianos, you will have the real feeling of playing an acoustic piano. More than that, the volume system of both Yamaha P45 and Yamaha P71 is very satisfactory. I am sure that two above mentioned digital piano has a loud volume system. This can ensure an excellent public performance for pianists and meet the expectation of audiences. Besides, they also have an attractive design that is apparently eye-catching to the youth. Both of two digital pianos have clear indicators that can show you the level of volume, power, sound quality, and other elements concerned with music and live concert. This is essential for your performance all time. Another plus point that both Yamaha P45 and Yamaha P71 possess is their insurance system is good. When you put this aspect into comparison, both digital pianos have a long time for insurance, 4 years for Yamaha P45 and 5 years for Yamaha P71 respectively. When you have any problem with your digital pianos (two pianos mentioned above), you can contact immediately to the customer service center. General speaking, digital pianos have become more and more prevalent in our daily lives. They draw the attention of many people, especially pianists and audiences. I am sure that this kind of piano will satisfy all music demand at present. In recent years, Yamaha P45 and P71 are two new digital pianos that lots of young people favor on Amazon website. It is apparent that they have certain similarities and differences that you need to know. To some extent, two above mentioned digital pianos have a similar appearance, keyboard system, portability, design, sound quality, and insurance. However, there are also some distinctions between Yamaha P45 vs P71 such as the ability to connect to other devices, polyphony, and cost. I do hope that my today article will help you choose a suitable digital piano.